In its four-hear history, MTV's Musical March Madness tournament has seen no shortage of Cinderella stories — Owl City's unlikely ride to the Sweet 16 in 2010, Disturbed's dream run to the Final Four in '11, F---ed Up's shocking upsets of Mumford & Sons and Radiohead last year — but eventually, the clock strikes midnight, the carriage transforms back into a pumpkin and the glass slipper shatters. In other words, they've each come up short in their quest for the championship. But with the 2013 MMM tournament set to tip off Monday, March 18, there's a whole new group of upset-minded upstarts looking to do what their forbearers couldn't: survive the field of 64 and unseat Tokio Hotel as tourney champs. And this might be the year one of them finally manages to do it. Why? Look no further than Imagine Dragons, who enter the 2013 tournament for the first time, though they're far from underdogs: After all, over the past year, they've scored two Hot 100 hits, made a pair of eye-catching music videos and launched a sold-out tour. In many ways, they're sort of the MMM version of Gonzaga — unheralded, but currentlysitting atop both the AP and the Coaches' polls. But rather than try to shirk the underdog mantle, the Dragons areembracing it ... and as they gear up for the 2013 tourney — where they'll face off against the likes of Fall Out Boy and Fun. — they're determined to shock the world, and win one for the little guys. 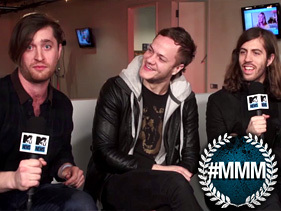 "This is the Imagine Dragons' Cinderella story, the underdog, coming out of nowhere" drummer Dan Platzman said. "We're going to take all these to-ranked bands down, with your help. If you can give 110 percent towards the vote, and set some strong screens ... we can win Musical March Madness." He's right: It's up to you to guide them to victory. After all, fans vote for the winners in all Musical March Madness matchups, and when voting gets underway on Monday, March 18 — when we unveil our bracket of 64 bands — Imagine Dragons' quest to go where no underdog as gone before will official begin. Can they accomplish their impossible dream? Well, let's just say they're not lacking in confidence ... or puns, for that matter. "It would be a real slam dunk," guitarist Wayne Sermon deadpanned.